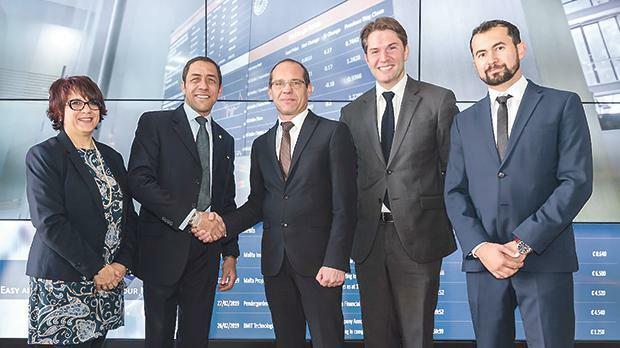 From left: Stephanie Galea, head of BD and marketing, MSE, Nick Bennett, COO, MDX, Simon Zammit, CEO, MSE, Johan Ditz Lemche, CEO, MDX and Vincent Pellizzari, head of trading, MDX. Malta Digital Exchange (MDX) has moved its expanding operations to the Malta Stock Exchange premises, ahead of the launch of its digital exchange division. The relocation of its offices to the Malta Stock Exchange demonstrates MDX’s commitment to building the world’s premier security token and virtual financial asset exchanges at the financial epicentre of one of the world’s most forward-thinking blockchain jurisdictions. MDX facilitates regulated trading of virtual financial assets under the definitions of Malta’s VFA Act and is in the process of obtaining a securities licence to operate a multilateral trading facility which will introduce a secondary market for the trading of digital securities. MDX will leverage leading global fintech firm Paritech’s Parichain technology, designed for professional, high volume B2B clients. Paritech specialises in the development and integration of low-touch, low-cost stock market brokerage systems and was founded along with Australia’s largest independent trading platform by a trading volume of over AU$50 billion per annum, by MDX founder and executive chairman Rick Klink. The move to the MSE is the latest milestone for MDX since announcing its impending launch in September 2018. In October 2018 it announced the appointment of Johan Ditz Lemche as its new CEO as well as securing Chris Truce, head of fintech at Saxo Bank, as a board member.